This time we’ve actually been creative and made our own meme for the episode, rather than stealing someone else’s. In the notes below we’ve provided links to share this meme around on Facebook and Twitter. This episode covers online activism against the new counter-terror laws in Australia, which take away our freedoms. 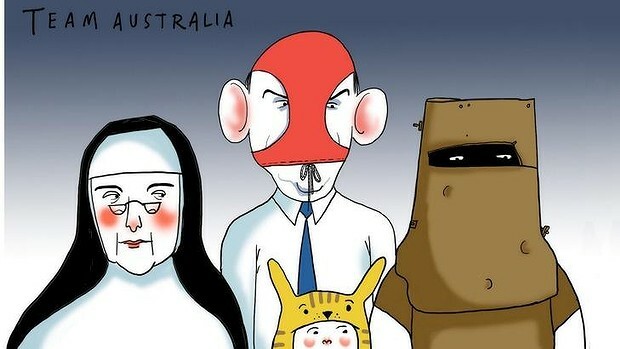 Some of the online activism discussed includes: Educate the Senate, stopthespies.org, the Greens campaign against the Foreign Fighters Bill, and Scott Ludlam’s #StopDataRetention memes campaign. 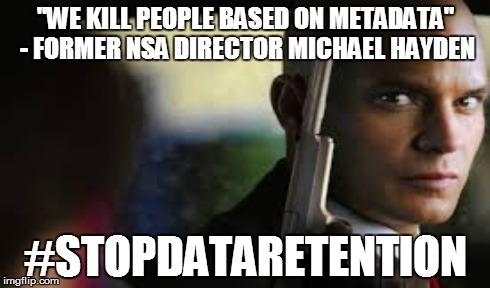 You can share our #StopDataRetention memes (including the one pictured above) on Facebook and Twitter. Also covered on the episode is we now live in South Park, updates on the inspiring #BattleForBurswood campaign, Rap News Live!, the excessive powers ASIO already had even without these new laws, Anthony Albanese criticises the first round of terror laws (although unfortunately he did this AFTER they’d already been passed! ), lawyer Stephen Keim’s speech on the problematic use of the term “terrorism”, the free e-book Against Authority by John Twelve Hawks, The Mother of Mohammed by Sally Neighbour, and our meme in response to Palmer United Senator Jacqui Lambie calling for a “barqa” ban – you can share this meme around on Facebook and Twitter. This episode is brought to you by “Mother”. You can hear Theresa on episode 45 discussing her research on the importance of Indigenous self-determination. Thanks a lot to Theresa for becoming a member of our show – you can become a member and sponsor an episode too. Rap News ‘G20 Rap with Tony Abbott – feat. Scott Ludlam [RAP NEWS 29]’, Austin Powers, stopthespies.org video, Scrubs ‘Season 2’, Legally Brown ‘Muslim Shore’s Got Talent’, Subhumans ‘Big Brother’. You can listen to a short (5 minute) version of this episode, which features our discussion on the website stopthespies.org, here: Stop the Spies. You can subscribe to these short versions of our episodes through Omny. 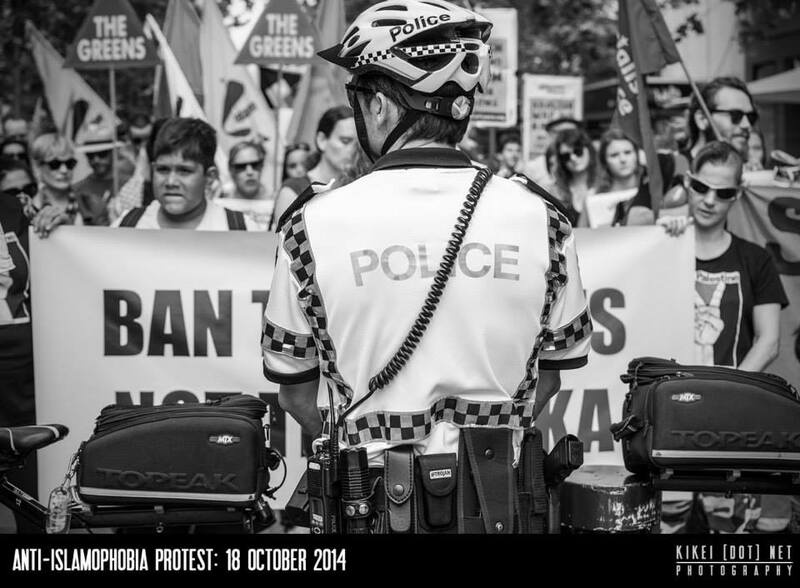 On this episode we look at some of the ways in which Australians are resisting Islamophobia. This includes rallies in Brisbane and Perth. We discuss our experiences of being at the Perth rally and play some of the speeches from the rally – including Muslim activist Marziya Mohammedali, David Fox from the Australian Manufacturers Workers Union, and Katie’s impromptu rant. You can watch all of the speeches from the rally here and you can see photos from it here. There’s also a discussion on online activism against Islamophobia, focusing on the Islamophobia Register Australia, the support they’ve received from non-Muslim Australians, and non-Muslims including journalists wearing head scarves in solidarity. We also give some updates on the Swan Island Peace Convergence (#SIPC14), which we covered on episode 68. These updates include the brutality they faced at the hands of Australian soldiers being exposed on the 7.30 Report, analysis from CounterAct, responses to common objections to the brutality the faced, and the history behind the convergence. Other stuff covered on the episode is: books for prisoners, our last episode on Islamophobia in Australia gets reviewed by a politics student, and Abbott is booed at the NRL Grand Final. Shout outs to Legally Brown and Fear of a Brown Planet! This episode is brought to you by “the usual Jon”. You can hear Jon on episodes 15, 21, 31 and 35! Thanks a lot to Jon for becoming a member of our show – you can see his Progressive Podcast Australia patch here and if you’d like one, you can by becoming a member of the show. Aamer Rahman ‘#BanTheBurka’, Native Deen ‘My Faith My Voice’, Legally Brown ‘Season 2, Episode 10’, Speeches from the Perth rally against Islamophobia – Marziya Mohammedali and David Fox, Katie’s speech from the Perth rally against Islamophobia, Austin Powers, Abbott booed at NRL Grand Final, Nazeem Hussain ‘Alcohol’, Logic ‘For My People’. You can listen to a short (7 minute) version of this episode, which features the speeches from the Perth rally against Islamophobia, here: Speaking Out Against Islamophobia. You can subscribe to these short versions of our episodes through Omny.